All the carers at Alderwood are absolutely wonderful and carry out their duties with enthusiasm and energy, going over and above what reasonably could be expected. Words cannot express how much we appreciate everything you do. My aunt has received perfect care at the best home in Colchester. She is receiving wonderful loving care, is very happy and settled and regards Alderwood as her home – we are so relieved to know she has so happy. You have much to be proud of in that wonderful home – such a superb, professional and caring team. I believe that it is critical in running a great home, to ensure that team members at every level feel respected and valued. Encouraging their input boosts morale and commitment and helps develop a sense of pride, belonging and purpose. Most importantly it means that our residents receive the best quality care. Situated in the heart of Colchester, Alderwood Care Home has so much to offer. 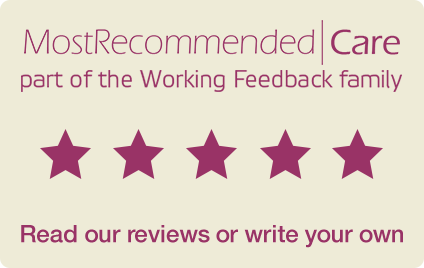 Alderwood Care Home is an award-winning care provider offering quality residential, nursing and dementia care that has been rated as ‘Outstanding’ by the Care Quality Commission. We take a serious and compassionate approach to elderly care where our qualified and experienced team makes our residents’ needs their priority. Whatever our residents need in terms of elderly care, we ensure that our team members are continually developing their training and skills to ensure they are qualified and confident in catering for anything that our residents may need help with, both physically and mentally. There are many compelling benefits to making Alderwood your new home. Find out why our residents chose us. The only care home in Colchester to achieve three outstanding measures.